This was a handy reminder that, however, confusing all the attachments are, I was totally right to treat myself to a Magimix food processor. 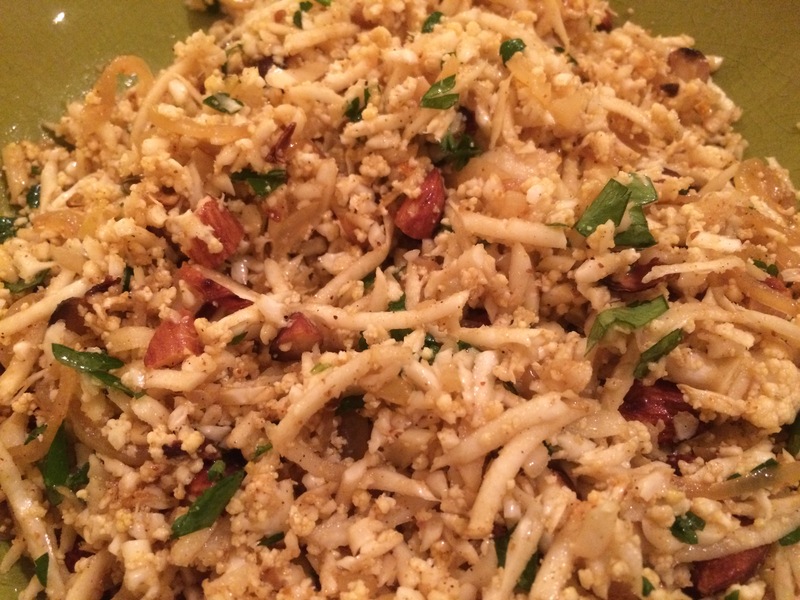 It is awesome – it took approximately a nano-second to grate the cauliflower. It was a bit of an Ottolengi weekend – as I also made this excellent beef stew with pale ale, juniper and prunes. I have to admit that prunes are never top of my list of anything really, but this slow cooked stew was really delicious – lovely and sweet because of the prunes and the date syrup and yet not overly so, because of lashings of pale ale, plenty of lemon zest and some not very well crushed juniper berries (note to self: must get a spice grinder soon). Traditionally Missy B prefers all the constituent parts of her meal to be easily identified, but she thoroughly enjoyed this winter warmer. I served it with a dollop of sour cream, as recommended, and some sprouts and mashed swede, just because I love them both and their season will soon be over. 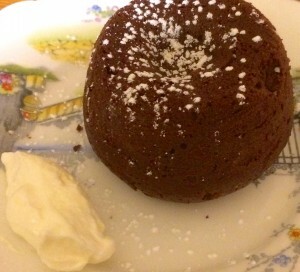 Dessert was these little melting chocolate puds – it’s an old favourite recipe from Florians, a Crouch End restaurant that is sadly long since gone. Butter 6 small pudding basins. Melt the chocolate and butter in a double boiler or in a bowl over hot water and stir until smooth. Add the egg mixture to the melted chocolate a little at a time. Fold in the flour carefully. Spoon the mixture into the basins and chill for 30 minutes (or longer – I baked the spares five days later and they were still great). Bake for 12-14 minutes. Experience suggests that if you want it lovely and runny inside, do it for 13. Loosen with a knife and serve with some ice cream or crème fraiche or just on its own if you prefer. If you are a family of three, try not to eat them all in one sitting. A large, shapeless mass of something, especially soft food: great dollops of cream figurative a dollop of romance here and there”… well you are right! my dollop is a drop!! I bought a spice grinder years ago, for about £12 if I remember well, and Nick still teases me about how much each usage has cost so far. (3 times, specifically to prepare my own sri lankan curry powder). I don’t recommend it actually, because it leaves dents on the wooden surfaces. If you find a good one let me know! Ah, I was reading via the email sent directly to my inbox so the link wasn’t a link! I remember seeing that recipe now and thinking, I’ll make that with some Hammerton beer! Thanks for the reminder!